The hum of turbine engines fills the air on a chilly December morning at the White Sands Missile Range in southern New Mexico. Cresting the horizon, two C-130 Hercules military transport aircraft approach a makeshift runway on the desert floor. The first plane lands and offloads Marines and tactical communications gear. The second aircraft lands downrange of the first and offloads an M142 High Mobility Artillery Rocket System and a launch team. Within minutes, the Marines are ready to send rounds downrange. The fire mission comes over the radio from the Force Artillery Headquarters and the communications team quickly relays it to the launcher. A countdown begins and observers hold their breath awaiting the launch. The rocket pierces the air and the HIMARS is enveloped in smoke. Seconds later, a second rocket leaves the launcher and follows the trajectory of the first. Over 30 kilometers away, the target is split in half as impacts from the rockets erase its existence across the white desert sand. These are the Marines of Battery D, 2nd Battalion, 14th Marine Regiment, 4th Marine Division, and they conducted a live-fire HIMARS air raid at White Sands Missile Range, New Mexico, Dec. 4, 2015. In a span of a few hours, the Marines were able to transport two separate HIMARS launcher teams from Biggs Army Airfield in Fort Bliss, Texas, and fire six guided multiple launch rocket system unitary rounds to eliminate a target 31 kilometers away. To accomplish this mission over a single drill weekend, the Marines required coordination from the 14th Marines regimental headquarters, which served as a Force Artillery Headquarters, 2nd Battalion inspector and instructor staff, the Army’s 1st Armored Division Artillery, White Sands Missile Range personnel, Marine Aerial Refueler Transport Squadron 452, Marine Aircraft Group 49, 4th Marine Aircraft Wing and VMGR-234, MAG-41, 4th MAW. “We originated the mission at the force artillery headquarters in Fort Worth, and transmitted it 800 miles via digital high-frequency transmission to a mobile platoon operations center at White Sands Missile Range that had gotten off a C-130 just five minutes prior, and put rounds on target,” said Col. Joseph Russo, commanding officer, 14th Marine Regiment. Although many aspects of this mission had been practiced in the past, this event was the first time a Marine Corps unit has employed this tactic using HIMARS and live ammunition. The end result showcases the ability of the HIMARS launchers to enhance a Marine Air-Ground Task Force. Given the instability in various regions of the world, this HIMARS tactic keeps Marine Forces Reserve ready to respond to any threat that may arise in the Marine Corps’ current areas of operation. Next year’s annual “Military Saves Week” is Feb. 22-27, 2016. Military Saves, a Total Force command program, is an opportunity to encourage Marines and families to focus on financial readiness, reduce debt and encourage savings. The 2016 theme, “Start Small, Think Big,” highlights the value of saving small amounts to reach long-term financial goals. This campaign gives leaders at all levels the opportunity to motivate and educate Marines and families about financial readiness. Commanders are encouraged to show support by signing a command proclamation in support of Military Saves Week and by sponsoring and supporting Military Saves events. Marines and families are encouraged to take the “Saver Pledge” at militarysaves.org and to start saving a little each month. In support of Military Saves, installation Personal Financial Management personnel are tasked with organizing and executing Military Saves campaign activities. PFM staff are requested to submit an installation campaign plan to the Headquarters Marine Corps PFM Program Manager no later than Jan. 4, 2016. Additional Military Saves campaign and financial education information is available from installation PFM staff or unit Command Financial Specialists, and online at militarysaves.org. For more information about the program, see MARADMIN 602/15. 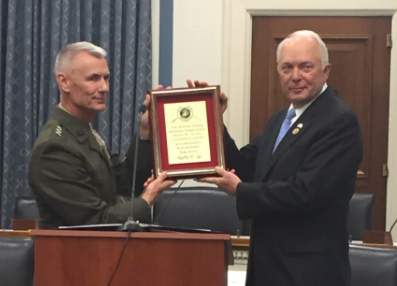 On 18 November the MCRA presented Rep. John Kline (MN-2) with the Maj. Frank Tejeda Congressional Leadership Award. The MCRA was privileged to have the CG, Marine Forces Reserve, LtGen Rex McMillian, present the award. This prestigious honor has been awarded to some of the Nations’ most influential Congressional leaders. The MCRA is proud to recognize Rep. Kline for both his military service as a Marine and his service in Congress, particularly his unwavering support of our nations’ veterans and service members. Named after Maj. Frank Tejeda (USMC), this award was created to honor those members of Congress that display the highest level of commitment to addressing issue effecting veterans and service members. Maj. Frank Tejeda embodied a level of commitment to our men and women in uniform, which stemmed from his own service in the Corps. He also served his Texas community as an attorney, Texas State Representative, Senator, and ultimately as a United States Congressman from the 28th District of Texas. As the Congressman from Minnesota, he serves on the House Armed Service Committee, fighting for veterans on a variety of issues including: VA healthcare reform, ensuring Tricare coverage and funding, and protecting victims of sexual assault in the National Guard. MARADMIN 676/14 announces opportunities and incentives for Reserve Marine officers who are willing to laterally move and assume critical skill billets as forward air controllers and battalion air officers. Officers who assume the billets mentioned are eligible for a $20,000 bonus. In addition, officers who are currently in receipt of a previous fiscal year officer affiliation bonus in the amount of $10,000, may submit for an additional $10,000 bonus if they are assigned to one of the billets previously listed. KNOXVILLE, Tenn. - Maj. Gen. Burke Whitman, Headquarters Marine Corps director of Marine and family readiness, presents the American flag to the family of 1st Lt. Alexander Bonnyman Jr. at Berry Highland Memorial Cemetery in Knoxville, Tenn., on Sept. 27, 2015. Bonnyman joined Marine Forces Reserve in July 1942 and was killed while fighting in the battle of Tarawa in 1943. Bonnyman’s remains were discovered in Tarawa 72 years after he was buried there. General Robert Neller received the battle colors of the Marine Corps from Gen. Joseph Dunford Jr. during a passage of command ceremony at Marine Barracks Washington, Sept. 24, 2015, signifying his new position as the 37th Commandant of the Marine Corps. MajGen Mark Brilakis has been nominated for promotion and for assignment as deputy commandant for Marine Corps Manpower and Reserve Affairs. MajGen Brilakis, a 34-year Marine, currently serves as Commanding General, Recruiting Command, MCB Quantico, VA. If confirmed, Brilakis will fill a post that has been vacant since late September when then-LtGen Robert Milstead, former deputy commandant for M&RA, retired. The department has been led in the interim by Sheryl Murray, a senior executive service official who serves as assistant deputy commandant for M&RA. On 29April - Lt. Gen. Richard Mills, Commander Marine Forces Reserve, delivered opening remarks at the hearing to review the Fiscal Year 2016 funding request and budget justification for the United States Marine Corps Reserve. The priorities th e General laid out some specific priorities to Congress, "We must remain manned, trained, and equipped to ensure we maintain the ability to seamlessly integrate with and support the Active Component." MARFORRES is planning on making revisions to the Force Generation Model to ensure units and personnel are ready to augment and reinforce a MAGTF. LtGen Mills stressed to Congress that Marines and Marine civilians are the foundation of all that MARFORRES accomplishes and their support to reserve specific programs remains crucial in recruiting and retaining Reservist. EQUIPMENT: When it came to equipment, the number one procurement priority is the KC-130J Super Hercules and the second priority is the RQ-21A Blackjack Small Tactical Unmanned Aircraft System or STUAS. TRAINING: Emphasis will be placed on the Integrated Training Exercise Program, which enables improved readiness, more efficient total Force Integration, and faster activation response times at the battalion and squadron level. FACILITIES: The focus of effort will be the Marine Corps' Reserve Military Construction Program which will focus on new footprint and recapitalization of aging facilities. To read his full testimony which will set the course of our Reserves click here. For the second consecutive year, longtime staff sergeants across the Marine Corps will face involuntary separation from the service. Officials with Manpower and Reserve Affairs announced the return of the Staff Sergeant Retention Board in Marine administrative message 264/15 on Thursday. Scheduled to begin work after the fiscal 2015 gunnery sergeant selection board wraps up its business in late June, the group is charged with whittling down the numbers of staff sergeants in uniform. As with last year, staff sergeants with between 15 and 18 years of service who've been passed over for promotion at least twice are on the chopping block. During the board's first audit of veteran staff sergeants, 233 of the 798 reviewed were cut from the service. The number of staff sergeants who will go before the retention board will depend on how many E-6s are selected for promotion to gunnery sergeant, said Yvonne Carlock, a spokeswoman for Manpower and Reserve Affairs. And because the number of Marines up for review will determine how long the retention board meets, there is no fixed date for it to adjourn, she added. Prior to 2013, staff sergeants could remain in uniform until retiring after 20 years of service. But with the drawdown in full effect, the onus is on longtime noncommissioned officers to move up or head out. Officials said incentives to exit the Corps, like the temporary early retirement authority, have failed to thin out the ranks of staff sergeants. Known as TERA, the voluntary separation program does not offer the same range of benefits as a 20-year retirement, but still leaves a departing Marine with a pension. All staff sergeants up for forced retirement also qualify for TERA. The gunnery sergeant selection board convened in late April. It is expected to wrap up in June, tapping about 1,900 staff sergeants for promotion. “My mission as the 4th Marine Division’s SgtMaj is to keep a pulse on the unit and keep the commander advised of any issues that I become aware of, and provide guidance to the other senior enlisted leaders within the division, both active and reserve,” said Fliegel. Fliegel is a combat engineer who served in the Persian Gulf War, the liberation of Panama in Operation Promote Liberty and completed four tours in Iraq after the 2003 invasion. This is the first time Fliegel has led Marines in the Reserve component, but he is pleased with current training schedules and requirements.